The forty-second year of the reign of Octavian Augustus; the whole world being at peace, Jesus Christ, eternal God and Son of the eternal Father, desiring to sanctify the world by his most merciful coming, being conceived by the Holy Spirit, and nine months having passed since his conception, was born in Bethlehem of Judea of the Virgin Mary. "Behold, the virgin shall conceive and bear a son, and they shall name him Emmanuel, which means God is with us." "For today, in the city of David - Savior has been born for you who is Christ and Lord." "And the Word was made flesh and made his dwelling among us, and we saw his glory, the glory as of the Father's only Son, full of grace and truth." God chose to enter into human history as a man in a particular place at a particular time and chose specific persons such as Mary and Joseph to be participants in the beginning of what would lead to our redemption at Calvary. This was not by luck or by happenstance - it was by the will of the Father, the work of the Holy Spirit and the cooperation of human beings like Mary and Joseph that what we celebrate today actually took place. All of us are born to live forever in glory in heaven. Jesus Christ was the only person born for the specific purpose of DYING for us. We should not overlook the fact that God Himself chose such precarious means to have entered the world - to have entered time in the way He chose to through the person of Jesus. Some argue that God could have chosen any number of ways to save us. Yet, He chose the way He did and that has made all the difference. Human existence would never be the same - God has taken on our humanity and elevated it to a new dignity, not seen since Adam and Eve before the Fall in the Garden of Eden. God humbles Himself to take on our existence, not only to give us an example of how to live, but to redeem our world in its totality - that is, all of creation is renewed and reborn. 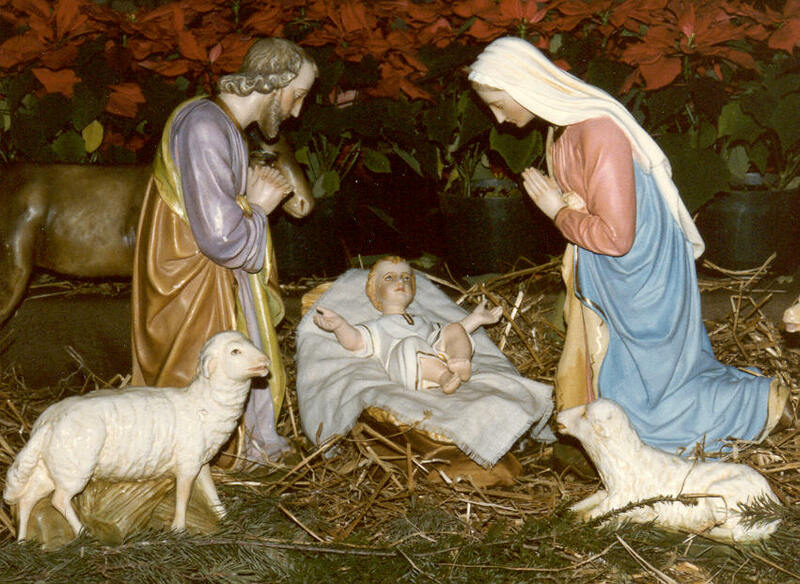 As we gaze upon the crèche this morning, we are minded of the great humility that God undertook to come among us. We are also reminded of how much more humble we all need to be for our Savior Himself chose such a very humble way in which to be born. As an aside, many of you remember the brilliant boxing career of the great Muhammad Ali. A name like Muhammad Ali and homily material rarely cross paths, so I couldn't pass up the chance to share with you a brief story about this former heavyweight champ. It actually has lots to do with humility. Ali was on a plane with his entire entourage on his way to another title defense at some point during the height of his career. As the plane was making its way to the runway. a flight attendant asked the champ to fasten his seatbelt. Ali replied brashly, "Superman need no seatbelt," to which the flight attendant calmly replied, "Superman need no plane either!" Now, I am not one to lean on Muhammad Ali for quotes, but I think that the flight attendant's reply is instructive. For ourselves, we ask "How often is our own self-estimation greater than the reality of things?" "How often do we make ourselves to be greater than we really are?" In comparison to God, we are nothing. And yet - that is exactly why the birth of our savior in humility should be so overwhelming for us. God actually condescended to take on our humanity. May we never forget the awesomeness of this mystery. No other world religion makes this kind of claim - that divinity would take on humanity in order to redeem it and so today, I invite each of you, in a spiritual way, to go to Bethlehem. Pay close attention to what you see and what you hear and what you feel. It is cold. It is dark. It is poor and it is VERY humble. Yet, in the serenity of that silent night, there is majesty greater than that of every kingdom this earth has seen put together. It is at long last the completion of what Isaiah had prophesied so many years ago - a Savior is born to us. He is a man like us, in all things but sin. He is born in a town called Bethlehem - which literally means "House of Bread" - a prefigurement of the Eucharist as the Bread of Life. This is why we are at Mass - to celebrate the Eucharistic mystery - the mystery in which Jesus comes to us not just at Christmas, but everyday at every Mass. May we not deprive ourselves of the Bread of Angels. Jesus thirsts for our love and gives us his very self. May we make some return of that love by our return to the sacraments with fervor. He was born in an obscure village, the child of ordinary people. He grew up in a small town in a carpenter shop until he was thirty. He didn't go to college. While he was dying his executioners gambled for his clothing, the only property he had on earth. Twenty centuries have come and gone, and today he is the central figure of the human race and the leader of mankind's progress. This Christmas, it is my prayer that each of us opens up our hears to the coming of the Lord Jesus - not merely celebrating Christmas as the commemoration of a historical event that occurred over 2000 years ago but rather - as a real openness to self-detachment. May we separate ourselves from all those things that keep us from allowing Jesus into our lives full - be it pride or lust or sloth or a simple unwillingness to be part of the life of the Church through our neglect of Sunday Mass attendance or frequenting the Sacrament of Penance. Unlike the innkeepers at Bethlehem who could make no room for Jesus, may we be found more ready to welcome Him this day and everyday. May we always recognize the fact that Jesus comes to us at every Mass, not just at Christmas. May each of us who are disposed - receive Him worthily. Let us do what we can this Christmas to make the path to the crib of the Christ child in Bethlehem a little easier for our families and our loved ones. May our acts of kindness and words of encouragement and peace be the greatest gift we make to our Savior as we fall on our knees and worship Him. I'd also ask that you pray for those members of our armed forces who are separated from their families this Christmas. May they find much hope and consolation in the birth of Jesus. Only he can save us - only he can heal us - only he knows us as we truly are and only He can speak to us in the depths of our hearts as we yearn for his final return in glory.